There must be something in the water in the Basque region of northern Spain to produce so much talent in one small region. 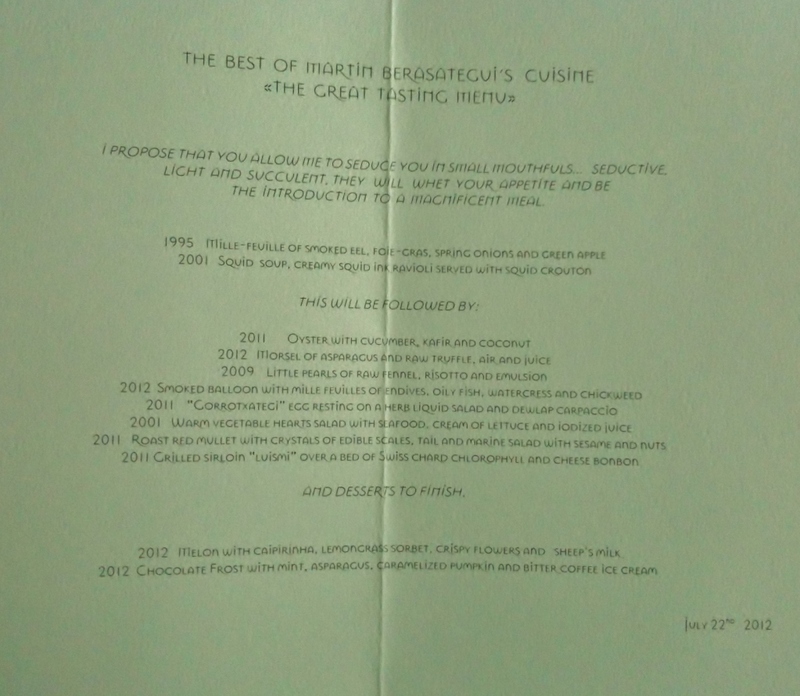 Martín Berasategui, born and bred in San Sebastián, Spain is perhaps the most famous of the chefs cooking in this region and keeping the El Bulli flame alight from the other side of the country. 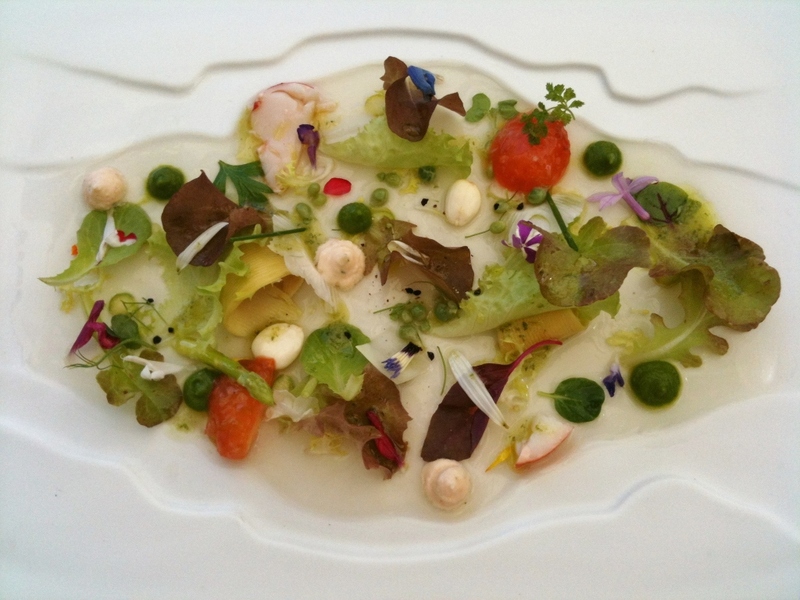 Martin Berasategui holds seven Michelin stars in total, three of which are for his eponymous restaurant on the outskirts of beautiful San Sebastian. Having worked and been inspired by some of the greats, including Alain Ducasse and Ferran Adria, his style of cooking is very current, featuring seasonal, locally sourced ingredients and focussing on intense flavours and surprising texture combinations. The taxi from the centre of San Sebastian to the restaurant is, however, less inspiring. We wound down suburban roads past a high rise housing development and under a graffiti-covered motorway bridge before we saw a sign indicating that, yes, this three Michelin starred restaurant was indeed, based here. One last turn and we were facing a curved modern building with panoramic windows looking onto a steep lawned garden. We chose a table on the terrace overlooking the garden and surrendered to the legions of waiting staff – glad Martin Berasategui is doing his bit to boost employment in Spain . Opting for the ‘Great Tasting Menu’ (no, they did not have an ‘Average Tasting Menu’ option) rather than a la carte, we also decided to let the Sommelier select wines by the glass to go with every two or three courses. The menu features 12 courses, ten savoury and two desserts - intended to be the highlights of Berasategui’s 30 year career, although there are seasonal changes. 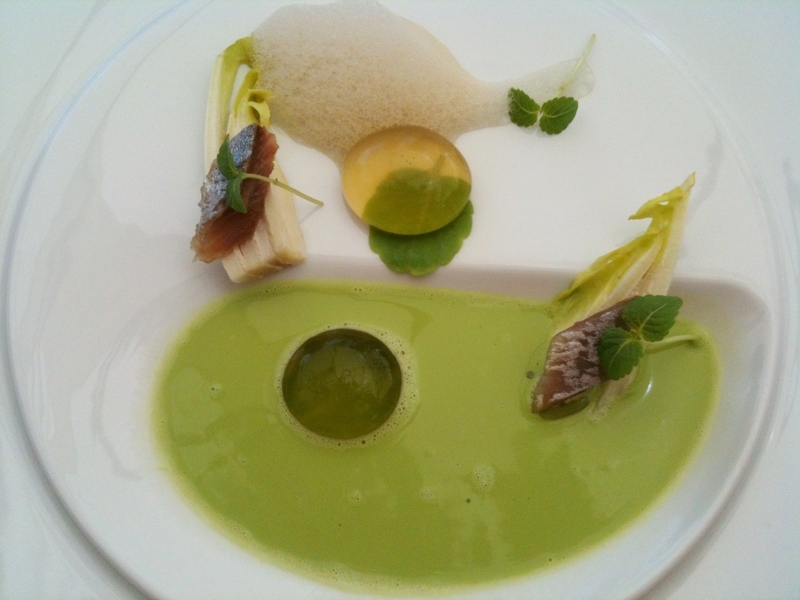 The first dish was a Millefueille of Smoked Eel, Foie Gras, Spring Onions and Green Apple which was concocted by the great chef back in 1995. 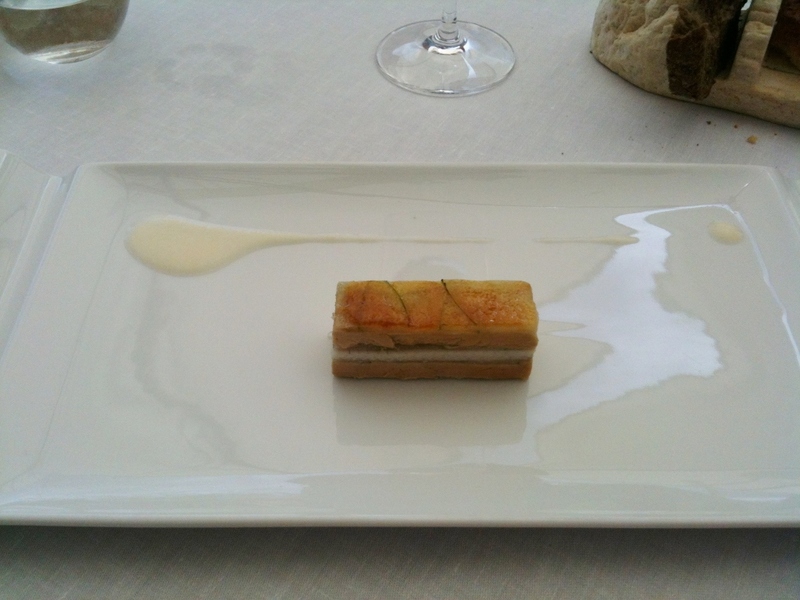 The dish really showed what a brilliant combination eel, foie gras and apple can be, with layers of smoked eel and foie gras interspersed with fine layers of the green apple and topped with a crisp layer of caramelised apple syrup, like the topping of a crème brûlé. Rich but delicate, with the onions and apple cutting through and providing lightness. An onion cream sitting alongside was intense yet fresh and light. A chilled glass of Grimau cava was the perfect accompaniment, providing a zingy foil to the richness of the dish. Our next mini-dish was even more pleasing on the eye. Squid Soup, Creamy Squid Ink Ravioli Served with Squid Crouton actually sounds quite humdrum compared to the taste sensation we experienced. The consommé was intense and had the rich sweetness/umami combo of lobster – the perfect home for the tangle of squid ribbons, cooked till they were a little squeaky but still sweet and fresh. 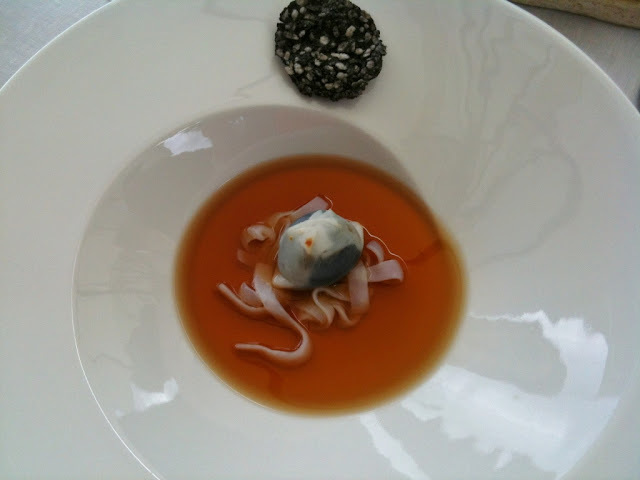 The raviolo balanced on top was in fact the thinnest layer of squid encasing an eye-popping burst of squid ink. The waiter, who must have seen a couple of squid ink explosions in his time, had pre-warned us to eat it in one bite. The crispy disk is also worth a mention as, in such a stellar establishment, immense time and effort had gone into reducing down squid ink, combining it with rice and then frying a thin disk of such intensity of flavour I am tempted to recommend Walkers try reproducing it for their next oddball crisp flavour edition – or at least try. By now we were settling into the afternoon and our taste expectations were rising by the second as we glanced greedily as large, white crockery was wafted to other tables. 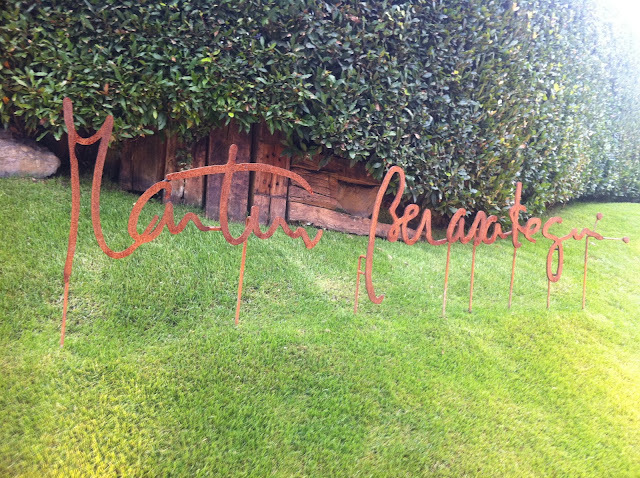 Martin Berasategui is definitely a man who likes to experiment with flavour and texture. Emulsions are intense and taste exactly of the main ingredient – an onion air so oniony yet so utterly light and ephemeral it takes this humble bulb to entirely new heights. Spheres and foams also abound, as do some of the most delicious jellies, used to hold together the more intricate, multi-ingredient dishes. And a complete absence of stodge – the carbs we are so used to eating as a vehicle for protein or simply as comfort-food. Apart from the bread at the start, this was the ultimate carb-free meal. So, if you are super rich and on a health kick, Martin’s your man. We moved onto a fresh, grassy white wine next – the Sota Els Angels 2010 made of 100% Picapoll (or Picpoul, if you prefer your wine in French) This was very well judged by the sommelier as it stood up to the next course gamely. Oyster with Cucumber, Kafir and Coconut is in keeping with the current trend of underplaying the title of a dish to exceed expectations on delivery. 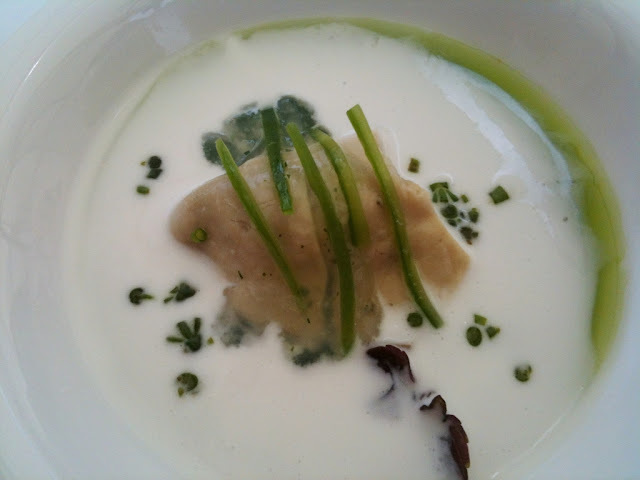 And deliver it did – two plump poached oysters rested on a cucumber and oyster jelly and a coconut and kafir lime cream. The combination of the cool, rich and citrusy was swoon-worthy, especially with contrasting textures of an unctuous jelly and a light cream. Shiso and seaweed kept the dish bright. More combination alchemy followed with the Morsel of Asparagus and Raw Truffle, Air and Juice. How we may have guffawed 20 years ago if someone were to predict that we would be paying three figure sums to eat ‘air’ and ‘juice’. More understatement here as this is no ordinary air but the condensation of raw truffle into a foamy cloud which leaves your tongue with the intense richness of truffle, quite extraordinary how a breath of bubbles can carry so much flavour. 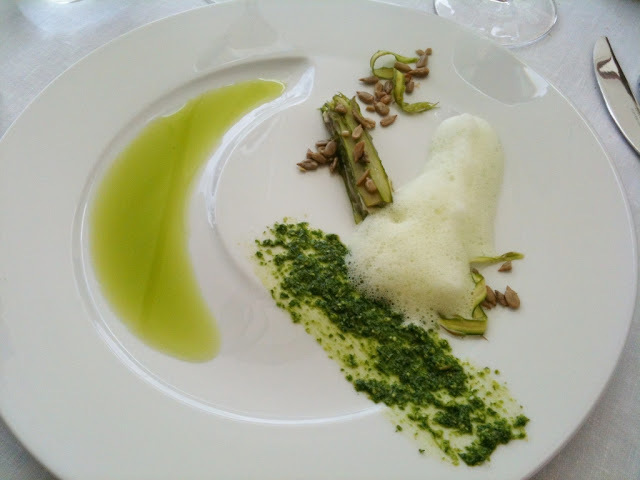 The layers of asparagus (the finest spears that had hardly been blanched) and truffle were topped with crunchy sunflower seeds, which can be seen growing inland from the town on the way south to Rioja. And then there was the asparagus essence, an intensely coloured and flavoured liquid which justified tipping the plate to capture every drop. There was also a smear of parsley pesto which seemed at odds with the superb flavour combination of asparagus and truffle and we could have done without. The next dish was basically a paean to fennel, served three ways – little dice of fennel in a creamy sauce was like a creamy risotto, while a light foam gave freshness to the dish and fine shavings of raw fennel made a good palate cleanser. And then we were onto slightly larger, heavier courses starting with the Smoked Balloon with Endives, Oily Fish, Watercress and Chickweed. This dish was stunning to look at. Translucent spheres against a crayon green sauce and bright white foam. The balloons turned out to be spheres of smoked salmon emulsion and the green liquid was a superb veloute of watercress and chickweed. 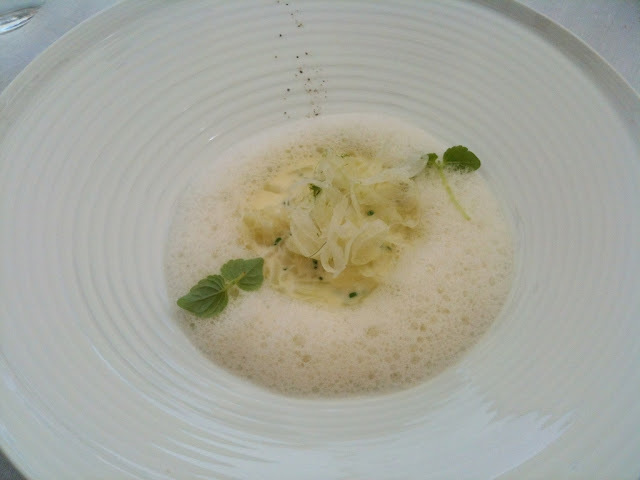 Sardine and endive made an excellent pairing and were lifted by the cress foam. We moved to a fragrant Viognier to wash this down – Vallegarcia 2010 from Castilla La Mancha. Anyone who was visited the Basque region will know that the language here really bears very little resemblance to Spanish or other Latin languages. Our next course was a ‘Corrotxategi’ Egg resting on a Herb Salad with Dewlap Carpaccio. According to the Cambridge dictionary dewlap is a fold of skin which hangs under the throat of a cow or a dog: as I am guessing there aren’t many dogs or their owners willing to give up their throats, even for the great Berasategui, let’s assume it was a cow’s throat. And the ‘Corrotxategi’ turned out to be an egg yolk which had been confitted (I may have just created a new past tense for ‘confit’, sorry France) in oil at 55 degrees for five hours. This intensified the flavours but still gave it the runny texture of a soft-boiled yolk. Combined with the liquid salad and the thin square of crunchy dewlap it worked beautifully. The smear of beetroot would have worked well too but it had hardened onto the plate and was nigh on impossible to scrape off. We were now ready to move onto a red wine and the Abadia de Retuerta 2009, we were assured, would see us through the next two courses. Made in the nearby region of Castilla and Leon, 10% cabernet gave heft to the fruity tempranillo and rounded this into a smooth and toothsome mouthful. 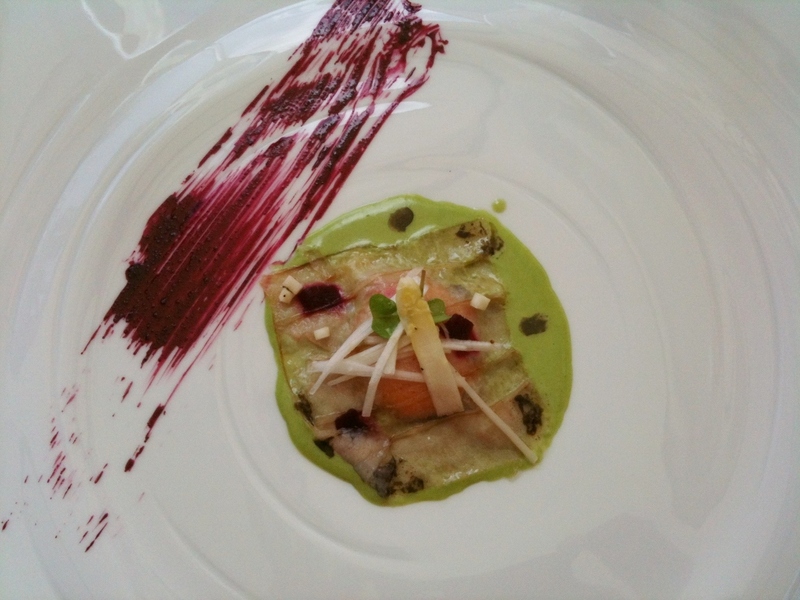 The next dish was a real looker – bright jewel colours resting in a glistening lake. Warm Vegetable Hearts Salad with Seafood, Cream of Lettuce and Iodized Juice yielded nuggets of lobster, swirls of avocado and nibs of hearts of artichoke and tomato strewn with assorted leaves and edible flowers. All suspended in the most gloriously intense, colourless tomato jelly I have ever tasted. And then there were the surprise bursts of verdant flavour from the spheres of ‘iodized’ lettuce juice and the lobster emulsion. A real stand-out dish and one I could happily eat every day, were I so lucky. Roast Red Mullet with Edible Scales, Tails and Marine Salad with Sesame and Nuts arrived next. The edible scales were a clever touch – the scales had been carefully removed, crisped up in hot olive oil until they curled and then replaced on the fish. Worth the bother, as long as you are not the poor sod delicately replacing the scales on the mullet. Perfectly timed fish with its crispy, scaly topping was flanked by two little towers – turned out to be unctuous, meltingly soft and slightly caramelised pig’s tail. Fabulous combination and cut through nicely with the seaweed salad which, along with the sesame and seaweed emulsion gave the dish a Japanese edge. A glug of extremely good olive oil kept things in sunny Europe. We had noticed that, so far, the only cutlery we received with each new course was a fork and spoon – everything was either bite-sized or tender enough not to need a knife. So when a knife was finally placed on our setting we felt ready for some real slicing and chewing. Not that the tender sirloin was much of a challenge, it was yielding yet cooked rare – a sure sign of some sous-vide sorcery – finished off in the pan to a nice crisp. A real pleasure to eat with the crisp, tender texture and the flavour of a well-hung beef. The photograph doesn’t really do justice to the intense greenness of the ‘chlorophyll’. This sauce was meaty and thick yet had a fresh, grassy flavour – hard to describe this combination but the brightness of the green was a good clue. Little spheres of a creamy cow’s cheese and a surprise hit of coffee air provided contrast and brought the dish together. To accompany, we had a Rioja from nearby Laguardia, a beautifully preserved hilltop town which is definitely worth a visit. 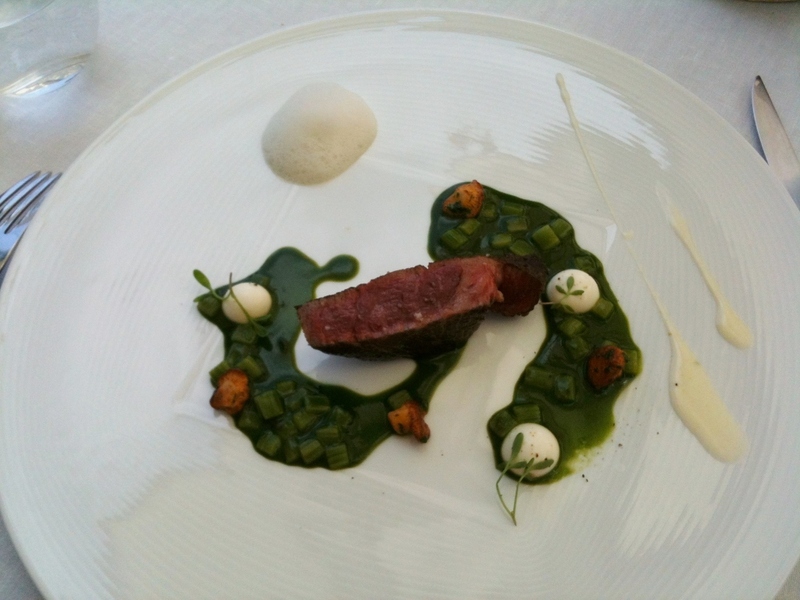 The Martue 2009 was fruity yet earthy, but perhaps a little too heavy for this dish. And so, onto the puddings. As the small delicious morsels had, by now, amassed to a feast we were thankful for only two courses, especially as we had already spied the petits fours that followed on neighbouring tables. But the first of the puds was so light and titillating, I would have asked for more if the weight of three Michelin star etiquette had not been bearing down on me. 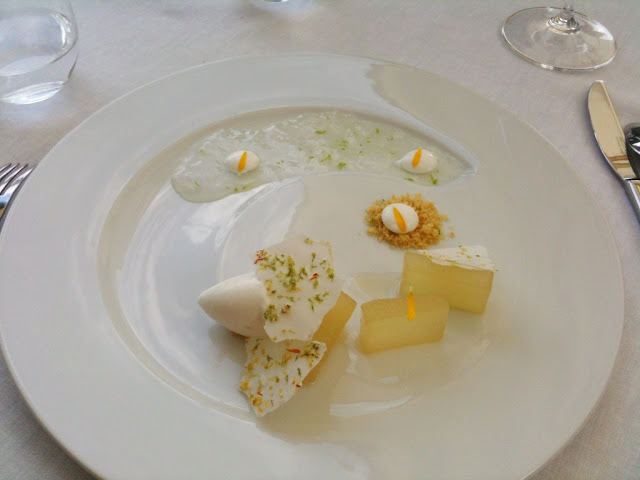 Melon with Caipirinha, Lemongrass Sorbet, Crispy Flowers and Sheep’s Milk looked pale and interestingly New Nordic on the plate but was beguiling on the tongue. These were no ordinary cubes of melon – these were melon cubes which had been vacuum-packed with caipirinha for 5 hours to give the crisp melon a glistening sheen and a whopping flavour sensation. The lemon sorbet was always going to be fragrant and refreshing and it did not disappoint, crowned with a white chocolate and meringue croquant which had been encrusted with flowers. The lemongrass jelly went exceptionally well with the sheep’s milk spheres which popped lusciously in our mouths. And then came one of the most unusual textures I have ever eaten. The final pudding featured something that looked like an Aero bar on steroids but when put in the mouth disappeared with a flourish of rich creamy chocolate – frustrating, but also rather a relief as I had been wondering where I was going to fit in another dessert. Amazing stuff. Alongside it was some caramel snow (granita, basically) and a very good bitter coffee ice cream. The menu said there were also asparagus spheres but I must admit I don’t remember them and damned if I can find them in the photo. Even so, a great coffee/chocolate combo. After this things began to get a little hazy as we threw caution to the wind and went on a mini wine exploration with Antonio, the sommelier with whom we were now on first name terms. We had now been at the restaurant for 4 hours and so we took our drinks for a walk around the garden and a chat with fellow guests – apart from 2 large Spanish families (shudder to think what their bills were) the other tables were mainly foreign tourists; everyone photographing each dish from every angle and a couple even tweeting each course. A wine based digestive called Patxaran is a very traditional Basque after-dinner drink that has been around since the Middle Ages but has recently had a bit of a resurgence with makers from Navarre using updated practices to bring out the flavours of the sloe fruit from which it is made, with a little help from an slightly aniseed spirit. On ice on a hot afternoon, we could have settled in for a few if coffee had not arrived. 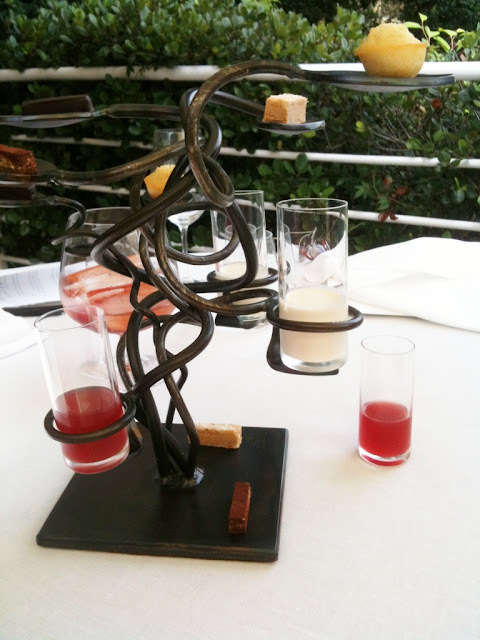 And with it came a bronze tower of petits fours. There was a watermelon cooler and an alcoholic, creamy drink along with some delicious salty nougat, an almond and lime financier and some dark chocolate logs that were filled with ganache. After we had coughed up over 500 Euros, including tip, and received our souvenir mini menu, our new buddy Antonio asked if we would like a tour of the kitchen (guess the other guests hadn’t drunk as much wine as us to be bestowed with this honour). The huge kitchen had the expected acres of stainless steel worktops and lots of water baths, steam ovens and other gadgetry which looked impressive but I couldn’t name. Martin Berasategui had already retired upstairs – he lives above the restaurant – but we met some of the 40 chefs who work here at well organised stations. All was calm and cool in the post-service lull and the chefs looked a lot healthier than the pale, sunken-eyed waifs one expects to see in a high-pressure kitchen. Maybe it’s the healthy carb-free diet or maybe it’s the huge windows that line one side of the kitchen. Lots of women, too, I was pleased to note. Berasategui has 10 restaurants around the world, from Shanghai to the Dominican Republic, but this is the only one that he always cooks at. His expansionist stance has earned him some criticism of late and could be why he has slipped down in the world’s top fifty restaurant rankings this year, but his three Michelin stars for this restaurant look pretty safe for now. All the wines were reasonably priced at 9 euros per glass. I would definitely recommend allowing the sommelier to choose the wines as his knowledge was impressive (especially of Spanish wines) and the huge wine list is a bit daunting, unless you are a serious wine buff. The website is http://www.martinberasategui.com. The address is Loidi Kalea 4, Lasarte-Oria (Gipuzkoa), 20160, San Sebastian, Spain. Tel +34 943 366 471 6. Simeen Kadi is a technology marketer and a bonne vivante. 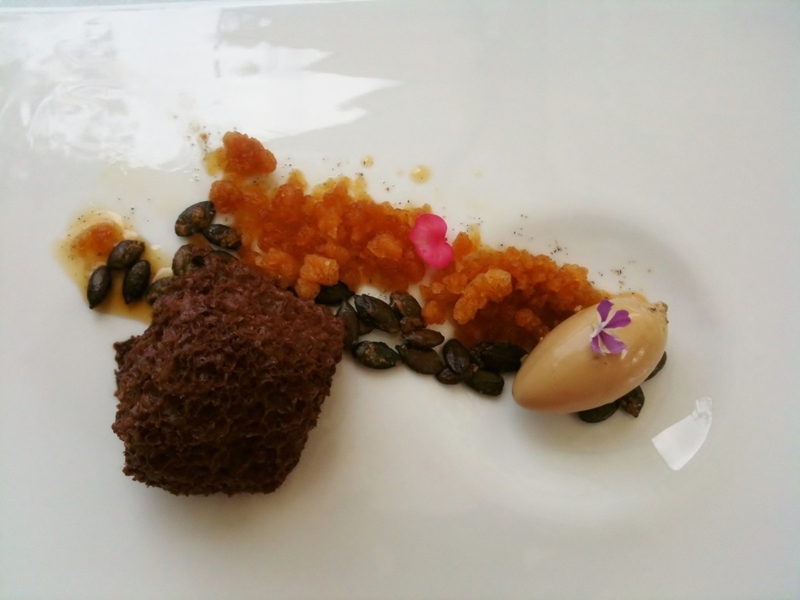 She has recently begun sharing her dining and drinking exploits as a guest reviewer, writing about food, cocktails and fun times from around the world. Simeen lives in and is in love with London. But it all still looks brilliant. 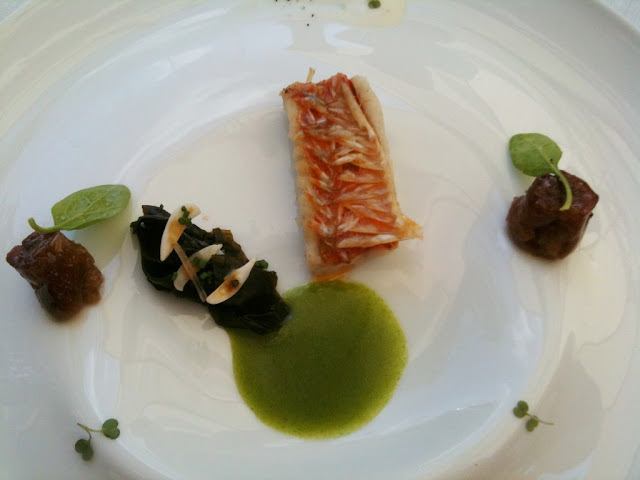 I especially loved the red mullet; probably the best red mullet I've ever tasted. 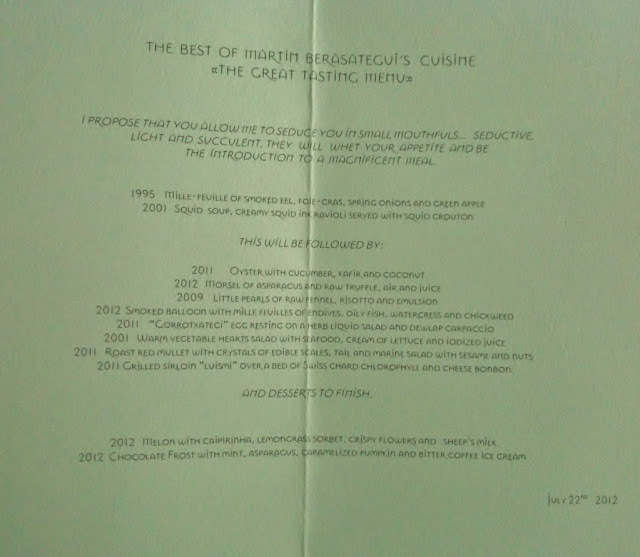 Martin Berasategui is my favourite 3 star in San Sebastian. His foie gras and eel dish is his best. Sadly I went before my blog and never got to write ite up. But I still have the menu - signed! This is one of the best reviews I have read in a long time! Ms Kadi may be a 'technology marketer' but her love, enthusiasm and knowledge of food and the way she effortlessly guides us from one course to the next is enough to make any of us jump on a plane. More of Ms Kadi please!